Today Nvidia has announced a new addition to the Fermi line of GPUs, the GeForce GTS 450, a more mainstream DX11-capable product with recommended price of $129 USD. 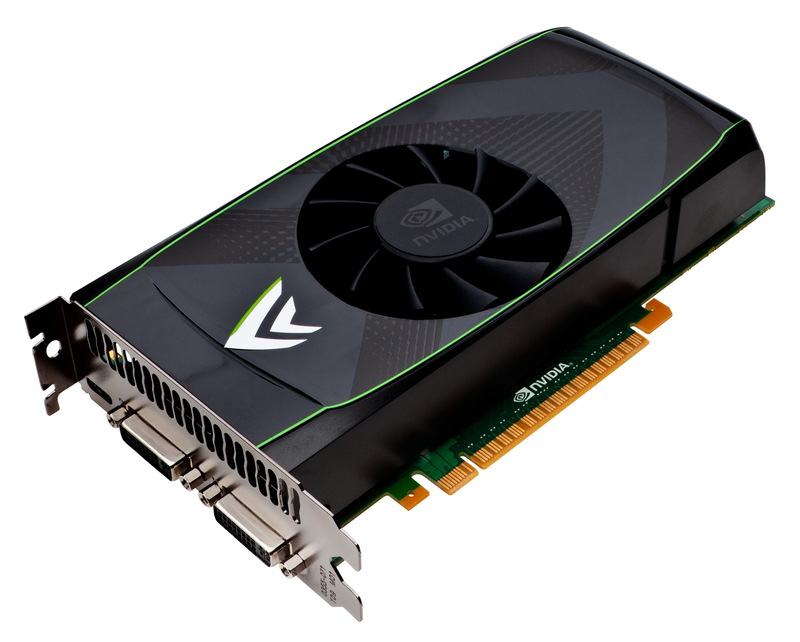 The card has 192 Stream processors (CUDA cores), 4 Polymorph Engines, and 32 Texture Units and 16 Raster Operators with a TDP of 106W, still making it quite capable solution for not so demanding gamers. The GPU is running at 783 MHz (1566 MHz for the Shaders), the video memory is 1GB GDDR5 running at a frequency of 3608 MHz with a 128-bit memory bus. Of course it also supports 3D Vision, but for gaming in stereoscopic 3D mode with that GPU you’ll probably have to sacrifice some of the high detail levels in the more demanding games in order to get better performance while playing. Some retailers like Amazon and Newegg already have the cards listed for pre-order or even are already are shipping products from some brands with wider availability expected in a few days. But I’m sure that you’ll be more interested in the new Released 260 driver form Nvidia, as I was (enough to do some testing during my vacation). 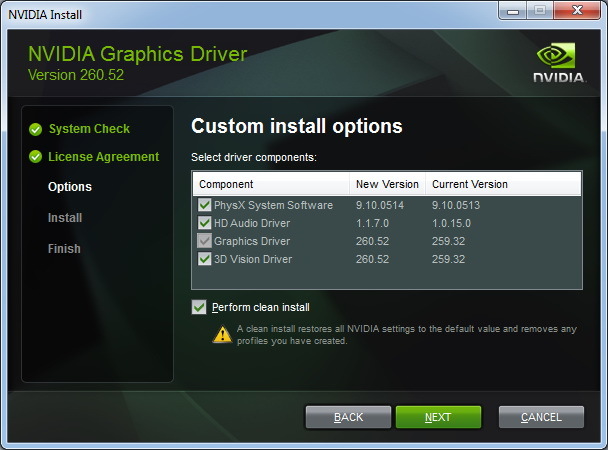 In the new 260.52 beta driver Nvidia has changed a bit the installer, making it more comfortable and maybe even faster for installation, as well as including all the additional components like PhysX or 3D Vision Driver. However the 3D Vision driver still supports only the free 3D Vision Discover anaglyph mode by default and you still need to install an additional USB driver to the IR transmitter that comes with the 3D Vision active shutter glasses in order to be able to use them. I personally liked very much the option to do a clean install right from the Custom installation menu, and after a bit of testing there are also some performance improvements over the previous driver, however on GTX 480 they are not so noticeable as probably on a slower Fermi-based GPUs like GTS 450 and GTX 460. The new driver apparently comes with an improved 3D Vision Surround Wizard, however I’m still unable to test that due to lack of enough 3D-capable monitors, so someone with a 3D Vision Surround setup can report on that. There is also a list with information and rating of a lot of games regarding their 3D Vision Surround compatibility and the new 260.50 drivers available for download here in a PDF file. Regarding the 3D Vision improvements, in the new drivers there is built-in support for 3D video streaming with Mozilla Firefox 4 and Google Chrome too. Apparently we are going to also have two more new 3D-capable LCD monitors, support for which is added int he new drivers and these are BenQ X2410 and NEC F23W2A, although we are quite short on any information about them so far. There is also support for Sony’s 3D Sweep Panorama picture format added to the 3D Photo Viewer as the MPO files produced by Sony’s cameras seem to be slightly different compared to the ones that were already used by Fuji’s 3D cameras. There are also updated 3D Vision game profiles for Mafia 2, StarCraft 2, Drakensang: The Dark Eye, Supreme Commander and Trine. Update: Nvidia has released 3D Vision Driver CD v1.36 Beta that includes GeForce GPU driver 260.63 and NVIDIA 3D Vision Controller Driver 260.63 instead of the expected 260.52 beta drivers. Have in mind that the 3D Vision Driver available as a separate download is now just the USB driver as the rest is included with the video driver. And aside from what was already mentioned about the 260.52 driver, the new driver comes with a few more extras like for example the added support for two new 3D Vision projectors: Sanyo PDG-DWL2500 and ViewSonic PJD6251. There is also a fix for the glasses losing sync to 3D Vision IR emitter that what would cause them to flicker and loss of 3D effect. There are also a few new 3D Vision game profiles added: Arcania Gothic 4, Fallout: New Vegas, FIFA 11, Formula 1 Racing, Final Fantasy XIV Benchmark, Guild Wars 2, Kane & Lynch 2 – Dog Days, Lead and Gold, Lego Harry Potter, Live For Speed, Lost Planet 2, Moonbase Alpha, Serious Sam HD – The Second Encounter, Shrek Forever After, Singularity, Vitrua Tennis 2009 and Virtrua Tennis 3.